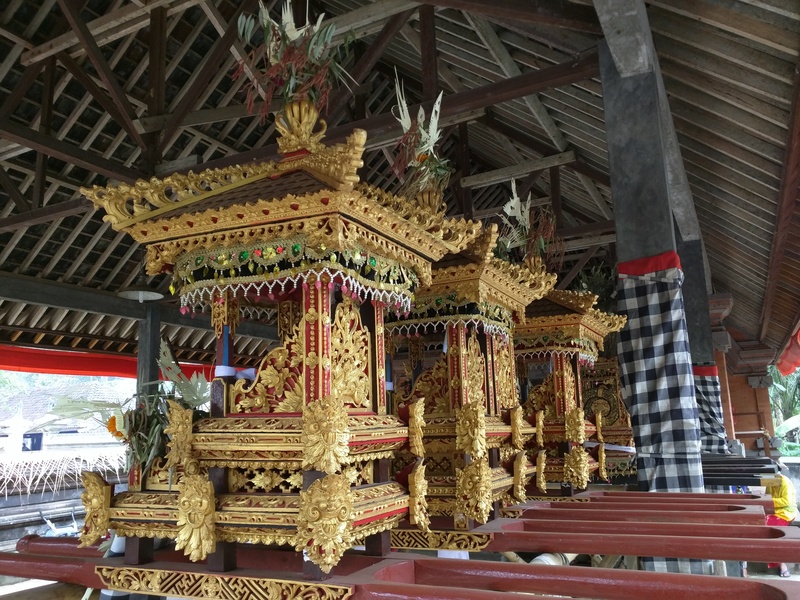 After getting our chill on in Gili Air we headed to Ubud, Bali to experience the Balinese culture. Ubud is the “love” section of the book Eat, Pray, Love so there are a lot of restaurants etcetera that use that to their advantage but most of Ubud was awesome to visit even though it was pretty touristy. The city somehow was able to still feel authentic and real even with the tourists. Balinese door with offerings out front. Everyday the Balinese make these bamboo boxes full of a little fruit, rice, and flowers as offerings to the spirits. 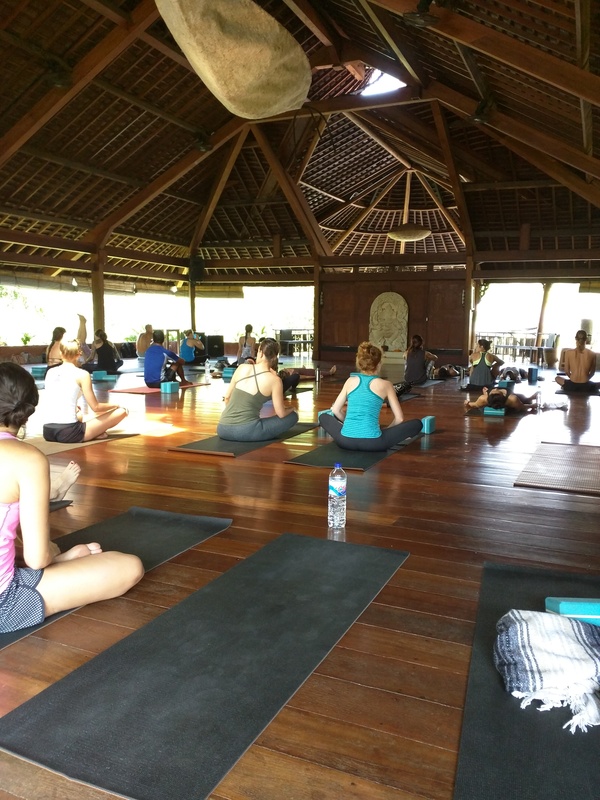 You can’t go to Ubud without going to yoga or meditation classes. We ended up buying a 3 pass to the Yoga Barn and did two Vinyasa classes that really kicked our butts and we were sore for like 3 days. We also were able to take a Tibetan Bowl Meditation class. This was probably one of the coolest things we did. During the Tibetan Bowl Meditation you lie on your back in a circle of people with your head towards the center of the circle and in the center there are the Tibetan bowls. The meditation is an hour long and you sit there while the leader gongs the bowls in a pattern. After the meditation is over you feel like you were sleeping but are unsure if you were actually sleeping (maybe that is what happens while you are meditating??) Basically it was a crazy experience and both Dan and I felt totally weird afterwards and unsure of what just happened. We also definitely want to do it again. Getting our yoga on at the Yoga Barn. You definitely can see the best of the best Yogis at a yoga class in Bali. We ended up taking a bike cycling tour so we could see the outside of Ubud and the rice paddies and smaller villages that surround the city. The tour started at the Mount Batur volcano which is still active today. From the volcano we went to a store where we were able to taste Luwak coffee and see the Luwak. A Luwak is a possum like animal (technically in the feline family) that eats the best Arabica coffee beans. The beans are then digested/fermented in the digestive tract and pooped out. The locals call it a catpoochinno (hee hee!). Those pooped out beans are then cleaned, roasted, and sold for exorbitant prices, $8 for a cup of coffee and $30 for 50 grams. Don’t get me wrong the coffee is good but it definitely not worth the price. 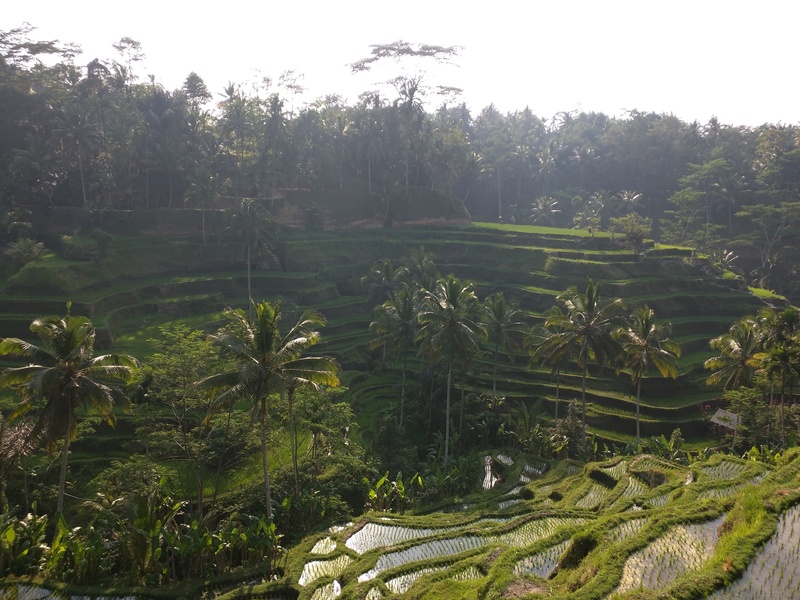 After the coffee tasting we got on our bikes and started the 2 hour downhill ride where we got to visit a Balinese home and see the beautiful rice paddies. View of Mount Batur. 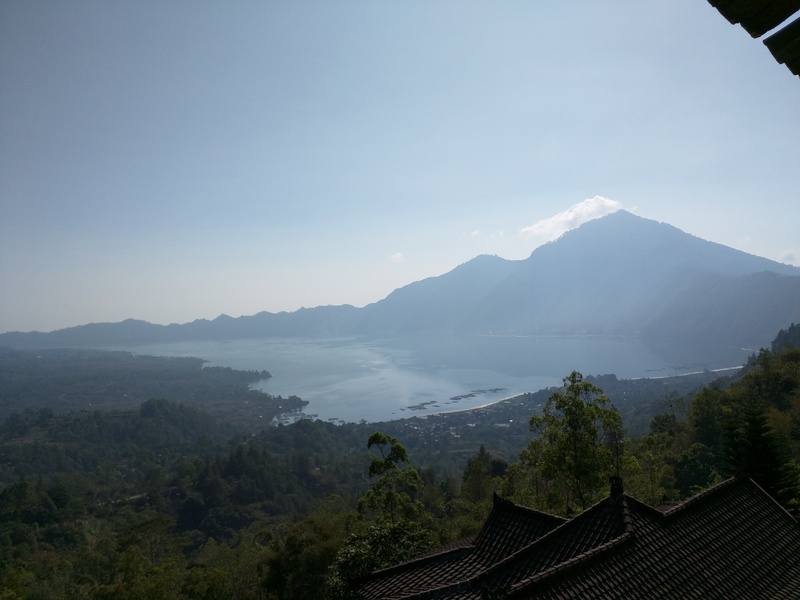 The lake around Mount Batur is believed to be a holy place by the Balinese. The tour was great because it was a downhill bike ride which is totally Kristin’s speed but also was really informative. We learned a lot about the Balinese culture and family. The Balinese are Hindu but have a unique form of Hindu that is blended with their traditional Bali religion. They believe that all things have spirits so every day they make offerings to temples, scooters, entrances to homes, businesses, etc. These offerings are believed to fend off bad spirits. The Balinese also believe in reincarnation and don’t celebrate their birthdays but celebrate their lives every 6 months. It was really cool to see a totally different culture and religion and learn about how they do things so differently. 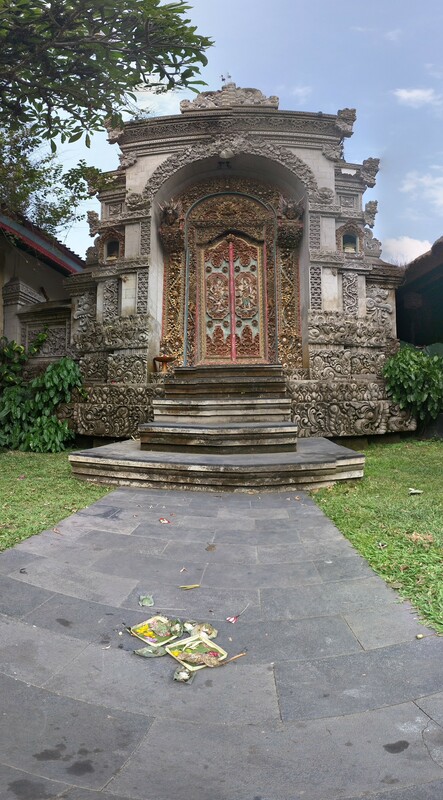 Balinese mini temples with intricate carvings. 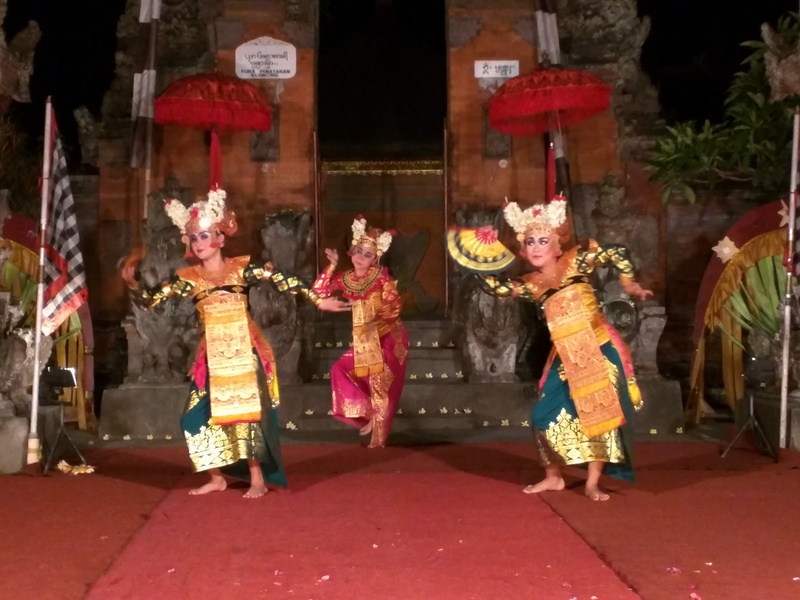 One of the other forms of Balinese culture is Balinese Dance. We were able to see a show one night that included multiple forms of dance and music that was super interesting. I loved the brightly colored costumes and gold headpieces. 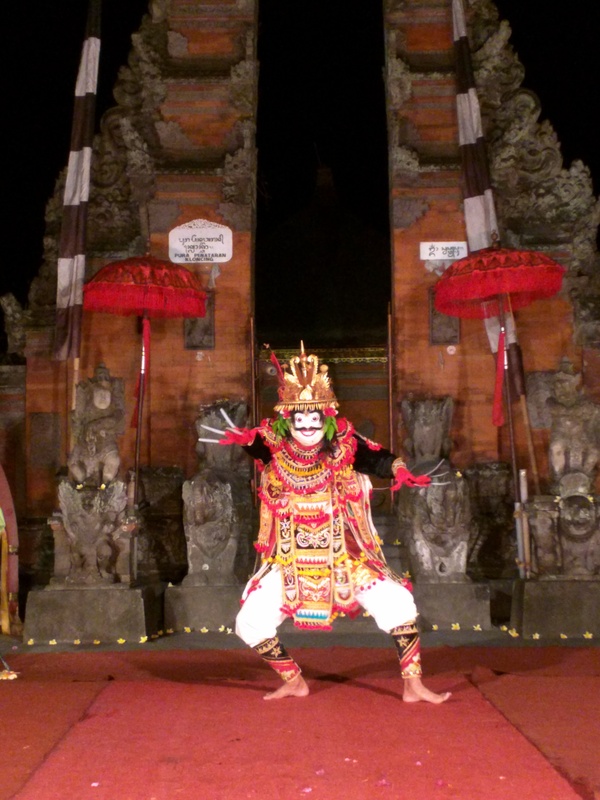 Barong Dance. 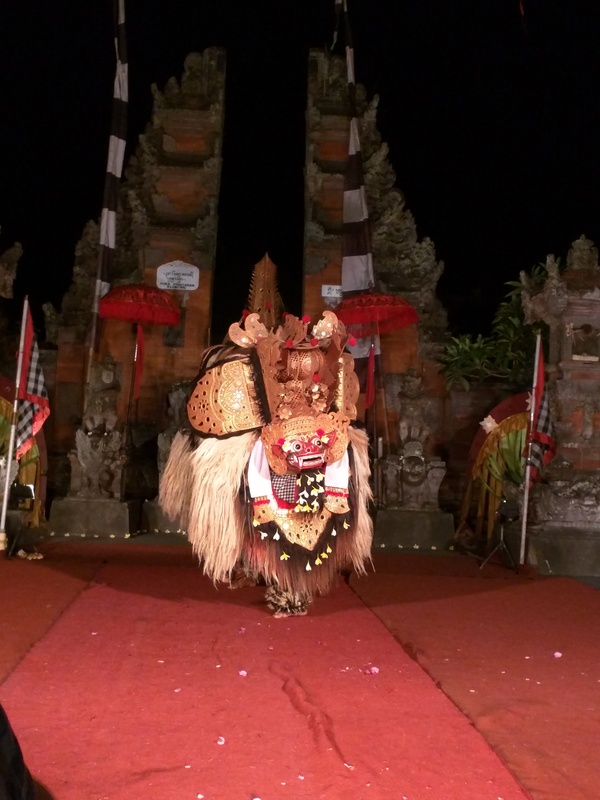 The Barong is the magical protector of Balinese villages. As “lord of the forest” with fantastic fanged mask and long mane, he is the opponent of Rangda the witch, who rules over the spirits of darkness, in the never ending fight between good and evil. 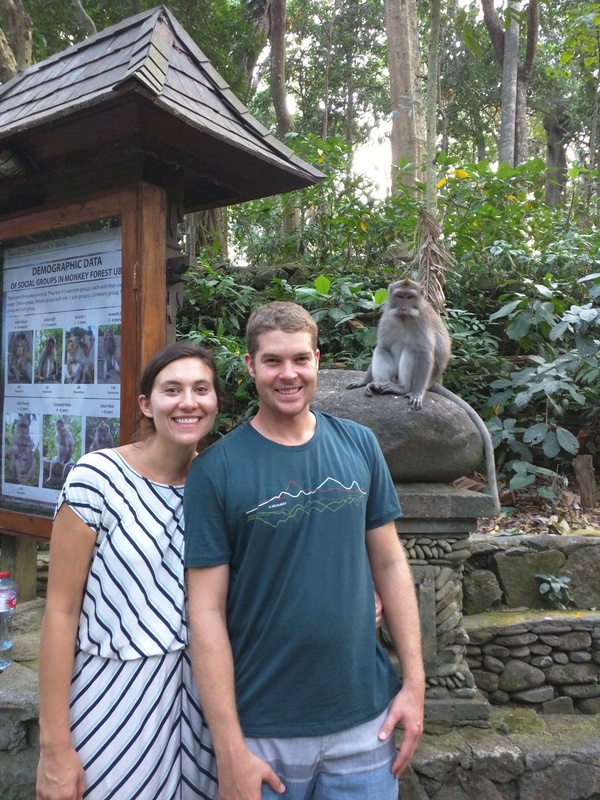 Another tourist attraction in Ubud is the Sacred Monkey Forest which is basically a forest where 5 troupes of Macaque monkeys live and there are a few temples to visit. You get to feed the monkey’s bananas and they will climb up onto you in order to get them. 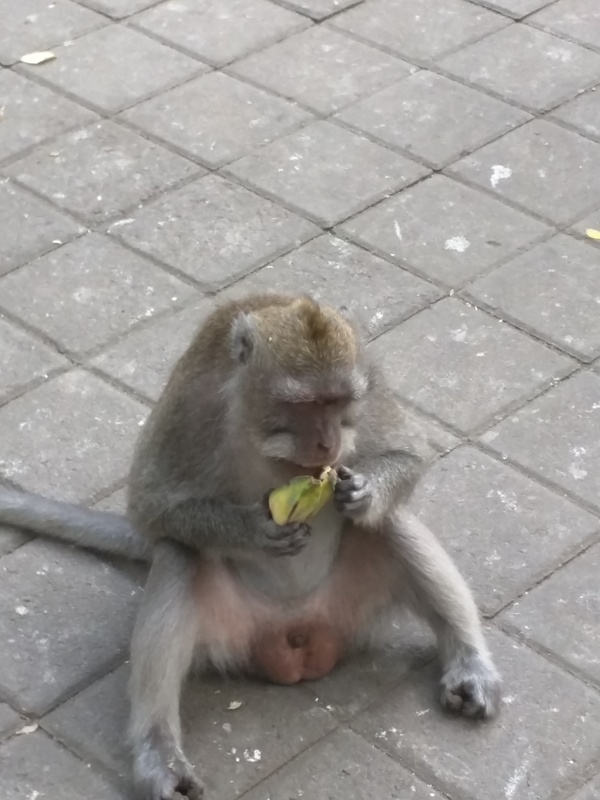 It was pretty fun to just sit there and watch them monkeying around (see what I did there??). 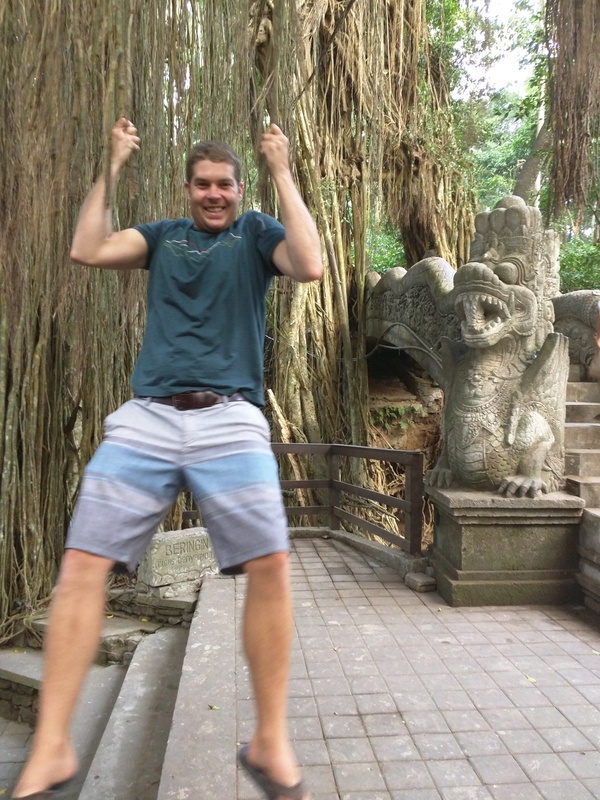 Dan swinging from banyan tree vines. The food in Ubud was really good with a focus on local ingredients including tons of vegetarian options, fresh juices, and great coffee. There is even a pretty decent sushi restaurant. One of the restaurant highlights was a great restaurant called Locavore where we went for lunch on our last day in Ubud. This place was unreal. They only have two menus, Herbivore and Omnivore, and you get to choose either 5 courses or 7 courses. We chose one of each of the menus and went for the 7 courses because why not?? The food was fresh, locally sourced, and really creative. It also ended up being like 15 courses because there were 4 amuse bouches and 4 desserts (on top of the two desserts included in the courses). The only caveat is that it was a lot more expensive than the other restaurants ($50/person) but I think it was totally worth it. 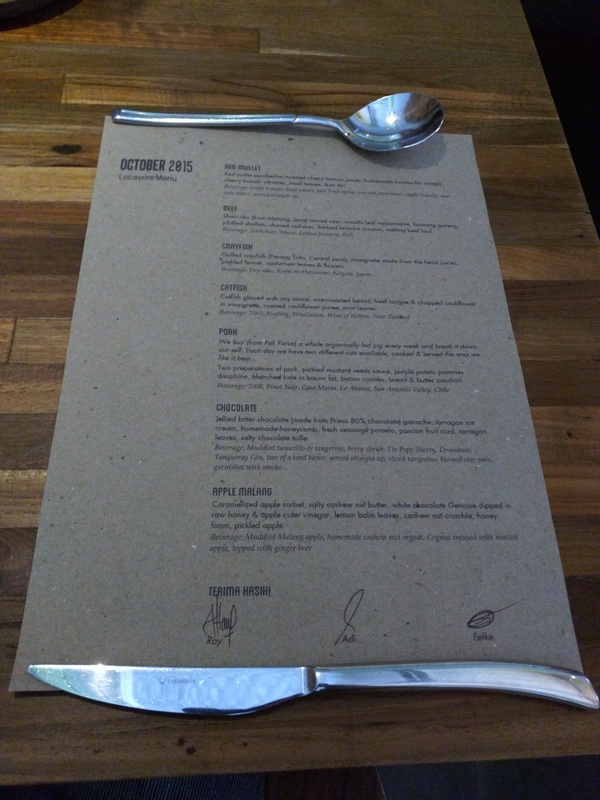 Omnivore Menu. Overall Omnivore beat out the herbivore menu. 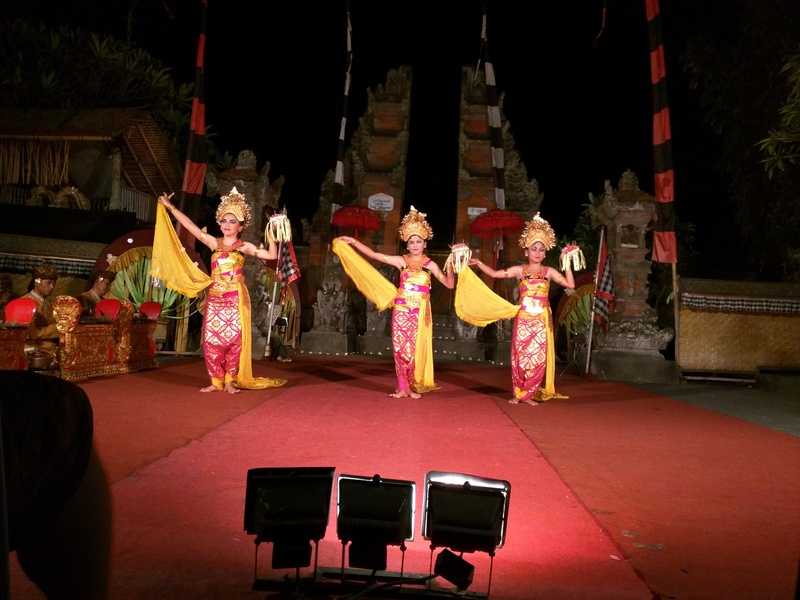 We were lucky to be in Ubud after a full moon because that is when most of the Balinese celebrations occur. We got to see the temples dressed up for the celebration and the locals bringing offerings to and from the temples. The local women carry the offerings, basically a giant cake stand stacked with fruit, on their heads. They are so good at this that we saw more than one local women balancing an offering on her head while texting with both hands. Village temple dressed up for ceremony. 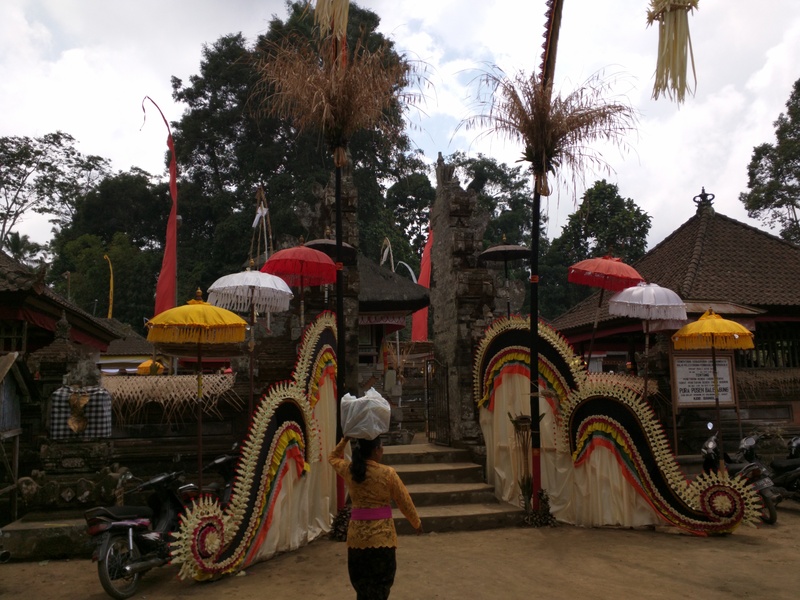 Ubud was a great place to experience the Balinese culture. The people here were so friendly and welcoming definitely a place we would recommend people to visit! Get your hippie on at a Tibetan Bowl Meditation class. 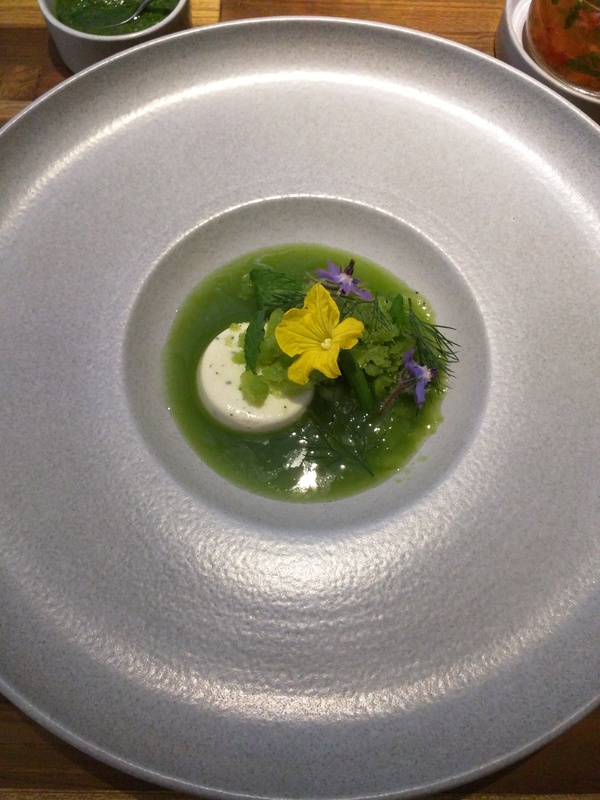 Treat yourself to a 7-15 course dinner at Locavore. Cycle through the rice fields. 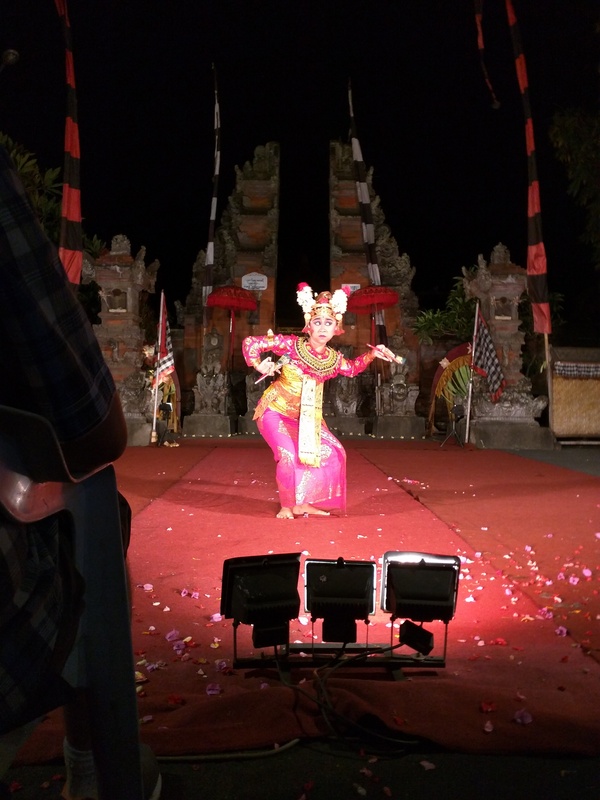 See a Balinese Dance performance. Grab an Indonesian or luwak coffee outside of a temple at night and watch the locals carry offerings on their heads to and from the temple.